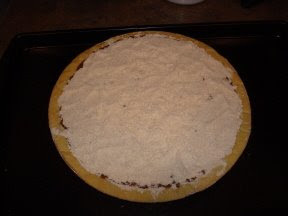 Step 1: Ready your unbaked pie crust. I'm not going to go into pie crusts here. There are so many different schools of thought on pie crusts that it could be a whole post in itself. Suffice to say, just get one together. For this pie, I am using one of the pie crusts that I have frozen and pre-stacked in my freezer so I can make a pie in a hurry. Step 2: Preheat your oven to 375 degrees. Cut these together with a pastry blender. If you do not have a pastry blender, I have found that crumbling them with your hands works just as well. You are making a nice crumb topping with this. 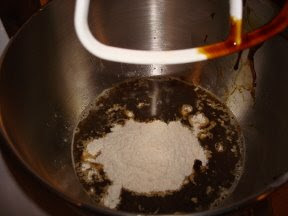 I use a combination of 1/2 molasses and 1/2 sorghum, or sometimes just the sorghum. Some people use dark corn syrup instead of either of those options. They all taste delicious, so use whatever is convenient for you. 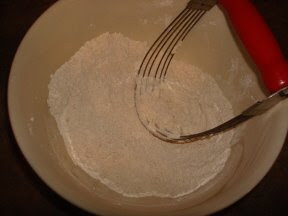 Add half of your crumb mixture to the contents in the mixing bowl and mix again. Pour the contents into your unbaked pie shell. Since this is liquid, it may help if you put your pie on a cookie sheet to reduce spillage. 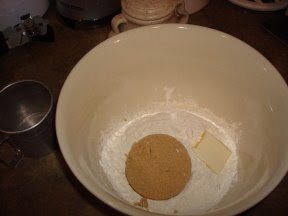 Finally, take the remainder of your crumbs and sprinkle them on top of your pie to cover. Bake for 35 minutes. Let the pie cool before serving. Some people like to eat it a little warm with whipped topping. Any questions? I offer pie support- just ask me if you need help. I may try this one tonight. I'll let you know how it goes. I've only had shoo-fly once. It was in ice cream when I was a little girl, and I remember loving it. That doesn't seem like it was the correct way to eat it at this point in my life. Stace- my husband eats his pie (any kind) with ice cream, but that is as close to shoo fly ice cream that I have seen. We also saw shoo fly fudge recently, which I can't imagine because shoo fly is very sweet to start with. I've never had shoo fly pie, only heard of it. I am not sure I'd like it. It's not chocolate. Me and crusts do not get along. I have yet to make a decent on. Oil or shortening. I have to this week. A child wants pumpkin pie for his birthday. Would you believe that I have seen chocolate shoofly's? They must taste good because they are chocolate after all. Hi I'm so happy to see this.. I've been not doing to much on computer very busy..But do have a question for you.. Do you know where I can find a donut pan I don't want to fry my donuts no more. You know how to contact me..I like your new blog lots...Thanks.. The tutorial was a great help. 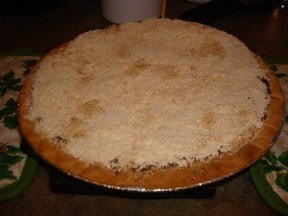 LOL Finally I can see a picture I still can't make a good shoo-fly pie I leave that up to Anna King LoL.. It looks so good when my wrist heals I will try again..I'm keeping this tutorial..